For extra long life in abrasive conditions or snow plowing, choose VBL™ Carbide Tipped Grader Blades. Tungsten carbide inserts brazed into a specially prepared groove in the blade will increase wear life several times when compared to conventional blades. This makes carbide tipped grader blades ideal for severe wear applications. Various sizes and shapes of tungsten carbide inserts are available to suit any application. To prevent premature base material wear “washout”, VBL applied-tungsten-carbide-matrix (TCM™), hard-facing or strips of hardened plate (VALSTRIP™) are available as options. 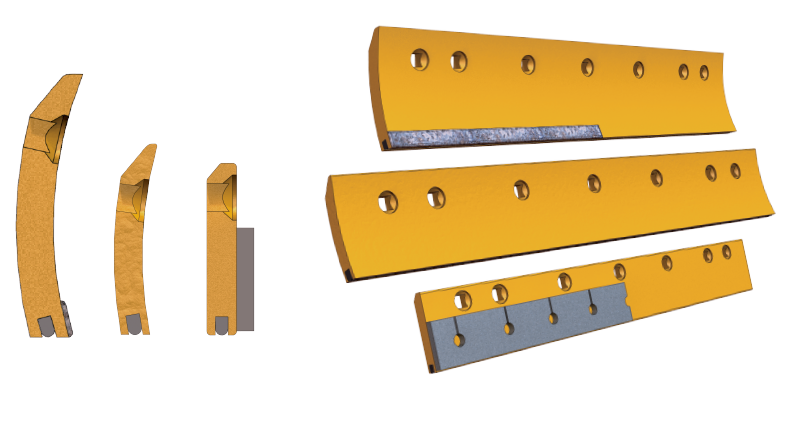 Carbide tipped grader blades are available in various sizes of flat and curved profiles* with hole sizes and patterns to suit all OEM equipment.